Rodeos aren’t just for cowboys anymore. Forklift drivers, prepare to saddle up and ride. Dot Foods, a California food distributor, recently got the chance to show off their driving skills at the company’s annual Forklift Rodeo in Modesto, CA. Workers competed in four different categories, including Narrow Aisle, Sitdown Lift Truck, Yale and the Mule (better known as the electric pallet jack). 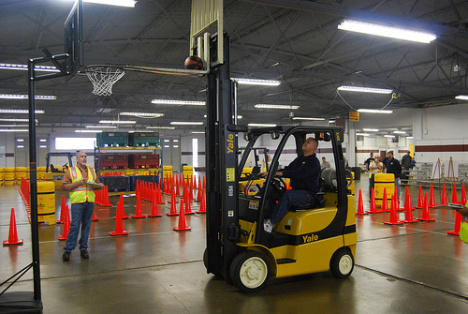 The contest is a popular way for forklift drivers to show how much they’ve learned. Experienced drivers went up against up-and-coming rookies, and the contest included many close competitions. The Forklift Rodeo is an anticipated event for many of Dot Foods’ best forklift drivers, and it’s also a fun way to forget about work for a while. Skilled drivers use their instinct and quick thinking to navigate through tight turns, transport loads and more. During the contest, there’s often an excitable cheering section to root their favorite drivers on. The winners of each of the 4 categories advance in the competition against seven other distribution centers scattered throughout the U.S. The final is to be held at the Dot Foods corporate headquarters in Mt. Sterling, Illinois. It will be held on June 19th – no word yet on whether the event will be available on pay-per-view TV. Skill is important for any forklift driver, and so is safety. Certifyme.net provides the best OSHA compliant training you’ll find anywhere. With 24/7 online access, our courses can help you become properly qualified on your schedule’s terms. And who knows? With your expertise behind the wheel, you may just end up at a forklift driving contest at your company! Please visit our contact page, or call (888) 699-4800 to set up your courses today. Our flexible and affordable OSHA forklift training will fit any budget. Go with the proven, superior source for the best forklift instruction – call CertifyMe.net today. Thank you for checking out the CM blog!